Having helped to slaughter 650,000 people. BASRA (Iraq) - British soldiers surrendered Basra city Sunday and fled to the airport. 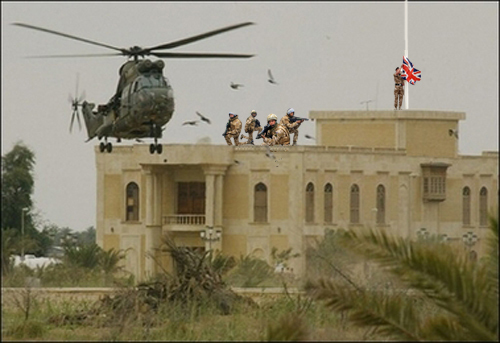 Muqtada al-Sadr’s army accepted the British surrender and took over the bases. Prime Minister Gordon Brown is due to set out a plan for total withdrawl for British troops in Iraq in a speech to parliament next month. The British defense ministry said forces operating in Afghanistan should also get out as we are doing nothing useful there and will be defeated. "This is a thoroughly sensible surrender," said opposition Conservative lawmaker Patrick Mercer. "It will allow all our troops to be withdrawn from Iraq in the autumn, just as Britain gears up to get out of Afghanistan."